Compare to the Angus McKie art seen here. 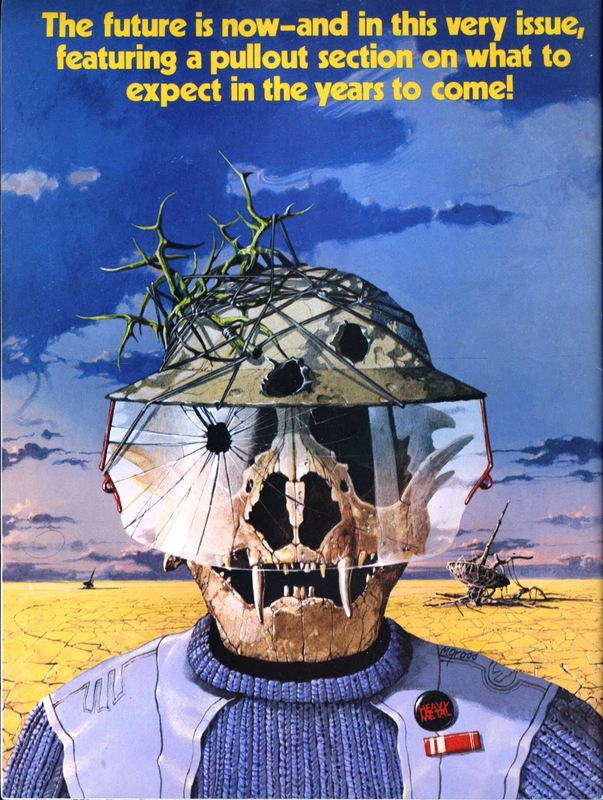 The skeleton in a spacesuit, representing the long dead astronaut, is a very powerful sci-fi trope that’s been around since the dawn of the genre. The decomposing explorer is often buried in sand and surrounded by a dead world. The attempt to colonize space, especially as a a result of escalating social upheaval or widespread devastation (i.e. a nuclear war) on Earth, is a deeply troubling idea to many and dates all the way back to the myth of Icarus. The image is a warning against the hubris of flying too high, of crossing thresholds we were not meant to cross, of challenging God. Ray Bradbury’s The Martian Chronicles (1950) is a famous example of the theme, as are the early sci-fi films Rocketship X-M (1950) and Flight to Mars (1951), to name just a few examples. I can’t find much information on Michael Gross. He has entries at the Internet Speculative Fiction Database under both Mike Gross and Michael Gross, for a combined ten cover works. Heavy Metal is not mentioned, but I know he did more than one cover for the magazine.